AgroAtlas - Diseases - Rhizoctonia solani Kuhn. - Sharp Eyespot and Rhizoctonia Root Rot. Rhizoctonia solani Kuhn. - Sharp Eyespot and Rhizoctonia Root Rot. Fungus Rhizoctonia solani Kuhn. belongs to imperfect fungi of the class Deuteromycetes, order Agonomycetales. Teleomorph Corticium vagum Berk.et Curt. belongs to the class Basidiomycetes, order Aphyllophorales. Rhizoctonia may cause damage at any time during the growing season, being more severe on young seedlings. Rhizoctonia solani can cause seed rot, root rot, and lesions on hypocotyls. Diseased seedlings may die, often in patches. Diseased adult plants become chlorotic. The primary symptoms of Sharp Eyespot are the lesions that develop on basal leaf sheaths. These lesions are similar to those caused by Pseudocercosporella herpotrichoides (Eyespot). But the Sharp Eyespot lesions are about 1-2 cm in length, more superficial and more sharply outlined than those typical of Eyespot. The margins are dark brown with pale, straw-colored center. The mycelium is often present in the center of lesions, being easily scraped off. Roots can also be affected, becoming usually brown in color and reduced in number. Affected plants may lodge, bending or breaking over where the spots form. The fungus forms mycelium and light-brown felt filaments (hyphae)(4-12 . in thickness) inside stem or leaf sheaths. Before harvesting it may produce brown to black flattened bodies (sclerotia), up to 3 mm in diameter. Teleomorph body looks like grey stretched pellicle attached to substrate. Flattened hymenophore consists of exclusively club-form basidia having four sterigmas. Basidiospores are unicellate, colorless. The fungus survives in soil as sclerotia and on decaying plant material as mycelium. Its brown filaments grow through the soil and roots and stems of developing wheat. 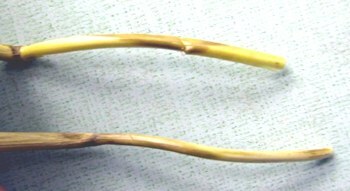 The fungus Rhizoctonia solani attacks roots and stems of many cultivated crops. The disease is usually more severe in fields that are continuously sown with cereals, especially with winter wheat. However, strong or widespread epidemics have not been reported. This fungus is present almost everywhere in soil and crop debris. According to scientific publications, the Rhizoctonia root rot has been found in the North Caucasus and Central European part of Russia (Moscow and Belgorod Regions). Infection is highly dependent upon environmental conditions. The withering and stem rot phases of the disease may occur in acid, dry, and sandy soils drying down soon after rain. Low soil temperatures favor disease development. Spring favors development of Sharp Eyespot. Isolates of the fungus produce spots at 10-25.C (optimum near 20.C). Rhizoctonia root rot causes stunting and quantitative reduction of tillers that produce undersized seed. The disease can result in premature death of diseased plants. Some actions can overcome the disease development, i.e., seed treatment with fungicides; wheat and corn crop rotation; sowing seeds in well-prepared soil under adequate rather than excess fertilization, using tolerant cultivars.